Very large selection of costumes!! Many costumes available in plus size too. She's got you in her sights, with this 4 piece costume that includes booty shorts, zip front vest, hat and gloves. Light up Costume. Just try and frisk me in this 4 piece costume that includes dress, tie, belt and hat. She's taking down the bad guys in this 5 piece costume that includes dress, waist cincher, gloves, handcuffs and hat. This corrupt cop would rather be cuffed than cuff you 4 piece costume includes button front dress with detachable belt, vinyl hat and handcuffs. After he cuffs you then the fun starts 4 piece costume includes hat, badge, short sleeve shirt and handcuffs. Don't ask questions that's her job 4 piece costume includes hat, short sleeve dress, waist cincher and gloves. Don't ask her what she's in for you won't believe it 3 piece costume includes hat, dress and handcuff belt. Shown with hose #1739. 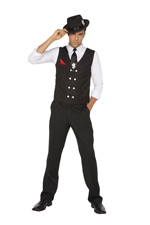 He's on the most wanted list in this 3 piece costume that includes shirt with attached vest, tie and hat #9075.